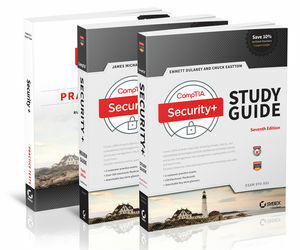 The NEW complete Security+ preparation bundle, with over 1,000 practice questions! 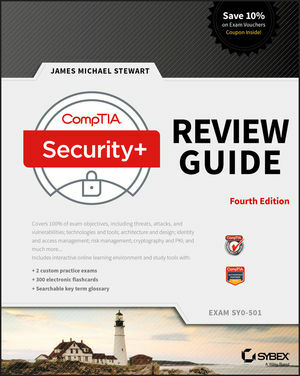 The CompTIA Security+ Certification Kit is the ultimate preparation experience for Exam SY0-501. Updated to align with the latest changes to the exam, this kit provides complete, expert coverage of all six exam domains. 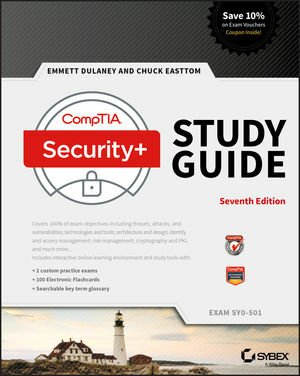 The CompTIA Security+ Study Guide clarifies crucial security topics and provides practical examples drawn from real-world experience, while the CompTIA Security+ Review Guide condenses essential information down into bite-sized pieces organized by domain. 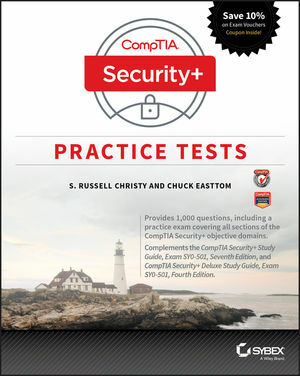 The CompTIA Security+ Practice Tests help you gauge your progress along the way, with six unique practice tests that help you diagnose weak points while there is still time to review. You also get a year of FREE access to the Sybex interactive online learning environment, which features a pre-assessment test, hundreds of practice questions, flashcards, and other tools to help you plan, prepare, and perform. Studying both content and technique gives you an advantage on test day, and the Sybex advantage means going into the exam with confidence. The CompTIA Security+ exam tests your knowledge of network security, compliance and operation security, threats and vulnerabilities, application, data, and host security. With clear guidance on critical topics including architecture and design, identity and access management, cryptography, risk management, and more, this kit provides everything you need to pas with flying colors. The Security+ certification sets your career on track. DoDD 8570-approved and a springboard to the CISSP and CISA, this exam is an important first step for security professionals seeking an advantage over the competition. The exam is challenging, so comprehensive preparation is key — and the CompTIA Security+ Certification Kit is the ideal resource for candidates seeking deep understanding with real-world context. Emmett Dulaney (Indianapolis, IN) is an Assistant Professor at Anderson University. He has written Sybex's CompTIA Security+ Study Guide, and co-authored CompTIA A+ Complete Deluxe Study Guide, CompTIA A+ Complete Study Guide, and CompTIA A+ Complete Review Guide. Chuck Easttom (Plano, TX), is CEO and Chief Trainer for CEC-Security, which specializes in IT security training and CISP and Security+ exam preparation. He has over 18 years in the IT industry, over 10 years teaching/training. He has authored 15 published books, including IT security. James Michael Stewart (Austin, TX), Security+, CISSP, CEH, CHFI, is a security expert, full-time writer, trainer, and researcher for Impact Online (www.impactonline.com), an independent courseware development company located in Austin. He has authored and contributed to over 75 books, including previous editions of the CompTIA Security+ Review Guide, and the CISSP Study Guide, both by Sybex. Michael provides IT instruction across the globe for various public and private organizations. Michael holds numerous IT and security certifications and much of his current work is focused on IT security and education. S. Russell Christy (Olive Branch, MS) is a Technical Trainer in Memphis, TN, delivering traditional and online classroom learning for adults, covering a wide variety of products. He specializes in Computer Maintenance and Network and Security; Microsoft Office applications; and Web and Print Design. For over 20 years he has deployed new desktops and operating systems, servers, network hardware and software, while simultaneously troubleshooting various hardware and software issues. Mr. Christy holds a Bachelor's Degree in Business Administration from The University of Memphis. He has additionally gained industry certifications in CompTIA A+, CompTIA Network+, CompTIA Security+, CompTIA Server+, MTA Windows Server Administration Fundamentals, Network Fundamentals, Security Fundamentals, and Windows OS Fundamentals, Microsoft Office Specialist 2013 Master, and Adobe Education Trainer.